With the boys going back to school later this week, I am all about the simple weekday dinners… meals that are easy to make, can be prepped or fully made ahead of time and feed a variety of tastes. This Baked Sesame Cauliflower is one of those meals and will be making frequent appearances at our house this Fall for sure. 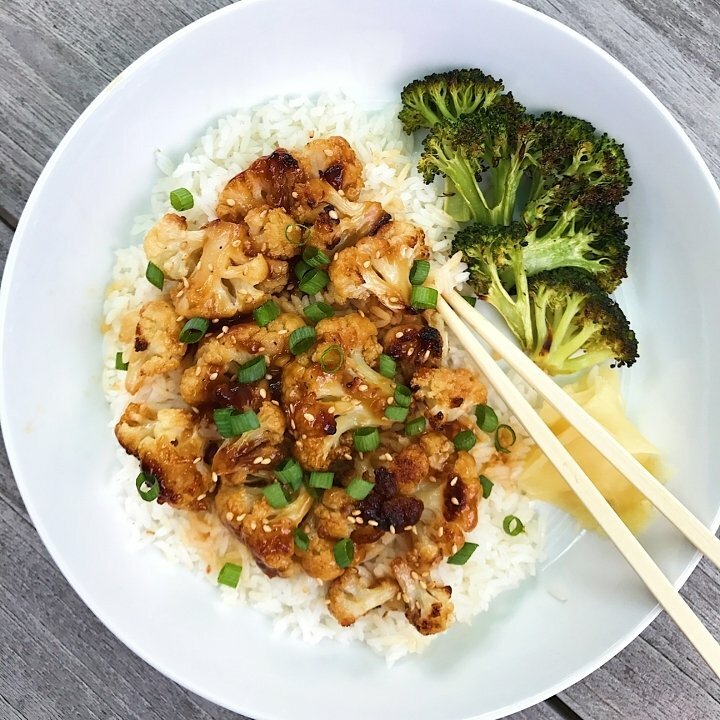 Recipe from my friend Jocelyn at wife mama foodie, the thing that makes this meal for us is the sesame sauce — it’s so simple yet so yummy! It’s just sesame oil, garlic, gluten-free tamari, rice wine vinegar, honey (or sugar), water and corn starch but you heat it up separately and it thickens to the perfect consistency and taste, just like at the restaurants, only better! In fact I doubled it and used half for some chicken I quickly stir-fryed for the boys. Served with rice and roasted broccoli it was an easy, crowd pleasing dinner. I doubled the sauce and mixed it with some stir fry chicken for the boys. Broccoli was tossed in avocado oil, sprinkled with salt and baked at 400 degrees for 20 minutes.